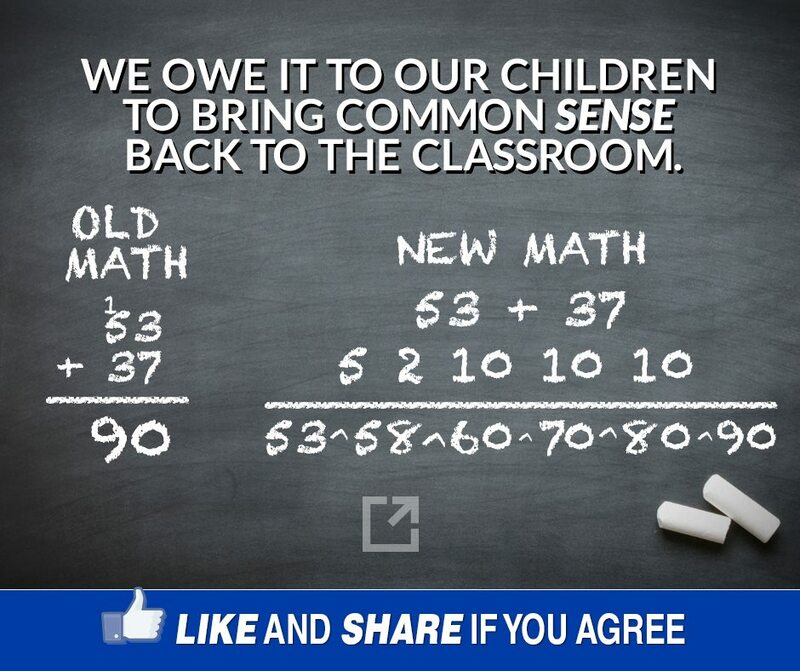 But contemplating the way arithmetic is taught today made me recall how it was taught when I was a kid. To me, the “new math” shown on the right side of the graphic is one small step beyond finger counting, slightly faster to compute than 53+1+1+1+1+1+1+1+1+1+1+1+1+1+1+1+1+1+1+1+1+1+1+1+1+1+1+1+1+1+1+1+1+1+1+1+1+1=90. In my school, we were drilled and tested constantly until we had memorized the various computations of numbers from one to one hundred and recognized them instantly. We knew that 26 plus 17 equals 43 because we knew that 26 plus 16 equals 42. It became part of our software, like the operating system embedded in a computer chip that tells the machine what to do when it is turned on. And it was tedious as hell. Although I was fond of my maternal grandmother, I always dreaded visits with her and her second husband. He was a physicist by trade and believed that small children would only fritter away the day if left to their own devices. They needed to be put to work. For me, that meant memorizing the multiplication tables, and one through ten was just the beginning. If I could not effortlessly spit out the answer to “What’s 15 times 11?”, I was sent away until I had mastered the 15s. He was kind of a prick. Damn. I’ll have to find something else to be pissed off about. Maybe people who don’t know that a preposition is the wrong word to end a sentence with. Chris – This is a situation up with which I shall not put! No criticism of your son (a PhD will only appended to my name in a second or third afterlife), but I think rote learning gets a bad rap. I know that the riff goes: “Many (most?) children nowadays have the attention span of a gnat, so you have to make it interesting.” Yeah, well, when we were kids, we had the attention spans of gnats with ADD, and somehow we learned to knuckle down and “learn our numbers.” If you think texting and tweeting has corrupted writing skills, innumeracy has equally damaged young brains’ ability to grasp spacial concepts. In the end, critical thinking skills go down the crapper. Bring back rote. Bring back the ruler across the back of the hand. Save the universe. Nice to see your son has some common sense about the role of Common Core. Getting kids to understand concepts and learn more than one way to skin a cat is not to exclude other ways – rote learning it still taught in school.